Okay, one word: WOW. I loved this film so much it’s unreal. I actually love a lot of Stephen King adaptations, they tend to be truly amazing, like Green Mile; that’s fabulous. 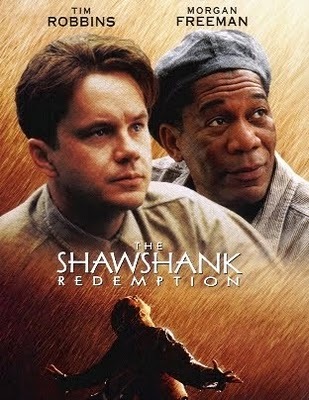 But, anyway, The Shawshank Redemption is an amazing film indeed. Morgan Freeman, who is God in Bruce Almighty, plays a wonderful role in the film and is an all-round awesome actor. The guy that plays Andy, Tim Robbins is equally as good, if not better; the way he plays the innocent man is just amazing, I don’t think anybody else could have done any better. I was hooked from the very beginning, and I almost cried in the middle, but I won’t tell you why. I won’t reveal any of the plot really because I had no idea what it was about and I thought it was better that way. Trust me, though, the ending really amazed me and it’ll amaze you if you just watch it with no knowledge of the film. I’d watch it again and even though I know what happens, it’s the type of film that will still tug at my heartstrings. I love the way that the story went on gradually, I mean a whole two hours told the story of ten years, but it seemed incredibly gradual and steady. You see the characters age slowly and in particular, there’s a bird that you see grow up.